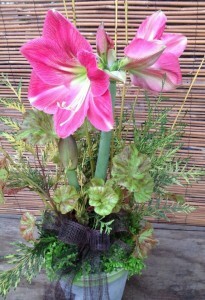 Amaryllis, unquestionably, are one of the most dramatic and elegant of flowers. That bold, beautiful blooms of all colors and sizes can emerge from such a drab, unassuming brown bulb is amazing. They are truly a wonder of nature! 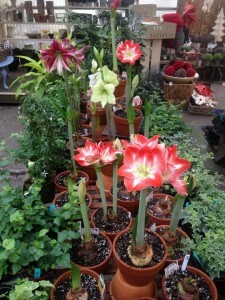 Our final shipment of amaryllis bulbs arrived the other day and now is the perfect time to pot them up for the holidays. It’s so easy to do too. My friend, Nancy Wallace of Wallace Gardens in Atlanta, swears by soaking the bulb in Haven Brand Manure Tea, an odorless tea that we have in stock now, for an even better display. In a shallow saucer filled with about an inch of this concentrated tea, soak the roots of the bulbs for no more than 20 minutes, then plant. From her picture I featured in the above link, she’s on the right track. I’ll be soaking mine this year! 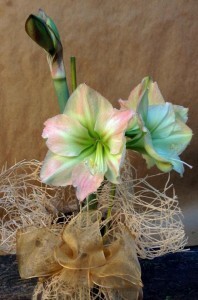 So, you want to purchase an amaryllis bulb (or more than one) for yourself or as gifts for friends? First, you need to know that the size of the bulb corresponds to the size and amount of blooms. 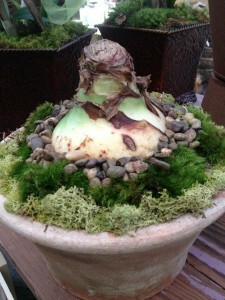 Their sizes range from “miniature” amaryllis bulbs to jumbo amaryllis and there are midsize bulbs as well. Beware of gift boxes and bags already prepackaged. I’ve stopped carrying them because, inevitably, the bulb begins to grow in the box prior to purchase. Believe me, there’s nothing sadder than an amaryllis, stem bent toward the light, growing sideways out of a box. It’s just not right! Potting them up is quite simple. First, soak your amaryllis bulb as described above so the roots rehydrate. Next, find a pot that is no more than an inch or so wider than the bulb and fill it with good quality potting soil (We use Fafard.) about half way up the pot. Next, position the bulb on the soil, pushing the roots firmly in place. The “shoulder”, or widest portion of the bulb, should be above the soil. Fill in around the bulb, push down gently, and water with some of the remaining manure tea. The hardest part is the wait for the bud to begin to emerge. It may take just a few days in a warm, sunny room, but it can just as easily take longer. Amaryllis don’t always cooperate with our timetables. Take a look at this “Holiday Flowers” post from last year and you’ll see what I mean. When you do see new growth starting to emerge, begin to water just so the soil stays slightly moist and watch the magic happen! You can also “dress up” the top of the soil with decorative moss or pebbles. 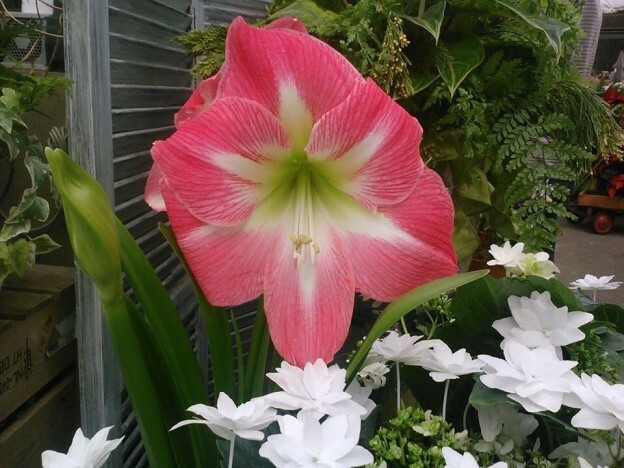 In bloom amaryllis can get quite tall and will usually benefit from some type of staking. In addition to simple bamboo stakes, stems of red and yellow twig dogwood, birch, curly willow, or branches from your landscape can be used. 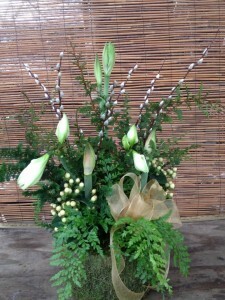 Insert the staking material at the edge of the bulb and tie it with raffia or ribbon. 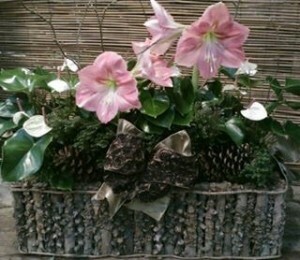 The pictures here show what we’ve done in the past using amaryllis. They make wonderful presents during the holiday season and simply watching the bloom stalk grow taller and the enormous buds begin to open is a gift in itself! In addition to bulbs that are available for you to plant, we also will be receiving many amaryllis already potted up from our growers. So, if you’re in the Birmingham area, there’s no excuse not to have one of these holiday favorites! 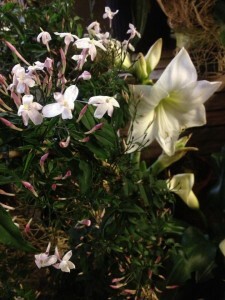 This entry was posted in Arrangements, Bulbs, Container, Fall, Flowers, Gifts, Holiday, Indoor Plants, Planting Tips and tagged amaryllis, amaryllis bulbs, arrangements with amaryllis, holiday amaryllis, holiday flowers on November 10, 2014 by Kris Blevons.